Naked and Hungry: Am I Allergic to my Pet? Am I Allergic to my Pet? Don’t guess whether you are allergic. Some people who believe they are allergic to cats with fur will miraculously not have symptoms around hairless cats. You are probably not allergic to cats. Just as I stated in my “5 Myths about Sphynx Cats” post, if you were allergic, it would be to the entire cat, not just the hair. Same with dogs. A runny nose and itchy eyes may be dust mites or the shampoo used to bathe your pet. Don’t guess, get a panel test. There are three types of allergies. There is environmental, medical, and food. There isn’t a way to test for specific food allergies (honest). There is a test for peanut sensitivity, but most food is too complex to do a serum test. You will know you have one by your body reactions; vomiting, hives, extreme gastric pain, anaphylaxis. Medication allergies can be just as violent. However, you can test for these sensitivities such as penicillin and Wellbutrin drugs. Most panel tests are chemical and environmental allergens; the latter includes cats and dogs (sorry, no test for other mammals and amphibians, but yes for arachnids and insects). If you suspect you have an allergy to ANYTHING, it is important that you seek a professional and know for sure. The Panel test is relatively painless. 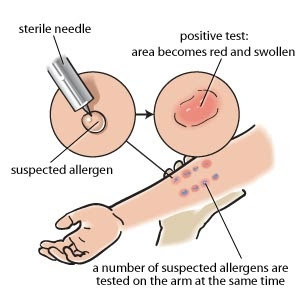 A serum containing allergen is on needles. The needles are tiny, just long enough to infiltrate the first couple of layer of the Dermis. After 20 minutes the reaction at the site of penetration is measured. The bigger the reaction, greater the sensitivity. Your doctor will give you some choices after your test. Food and Medication allergies are straightforward, avoid them altogether. You will probably be prescribed ann epinephrine injection pen if your allergy is severe. Epinephrine slows the histamine overload in most cases, but you will still need to seek emergency care if you have an anaphylaxis episode. For environmental allergies, you can first reduce your exposure. There are medications to reduce your symptoms, and you can work to reduce or eliminate your sensitivity through injections. Allergy shots take anywhere from 3-5 years, and the effect is not always permanent. I am currently taking allergy shots since moving to my mother’s home. She has wall-to-wall carpeting and curtains (I’ll explain in the next post why that is a problem), and my symptoms skyrocketed. I had a shot every week for eight months before I reach what is called “maintenance.” I now receive one shot a month. If at anytime I have a bad reaction to my shot the allergist can reduce my dose, and I would have to work my way back to a full dose by coming in once a week just as before. Though my symptoms have reduced, I still react if my exposure is high. Along with the shots, I had to change my environment.